Colonial storm shutters and Bahamas style storm shutters from John’s Shutter and Repair have to look of wood, but are made of strong extruded aluminum that meets or exceeds all Texas Department of Insurance standards and tested to withstand hurricane force winds up to 140mph. 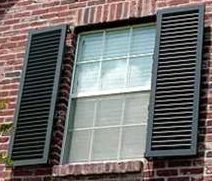 When Colonila or Bahama style storm shutters are open, they are an attractive addition to the outside of the home, when closed and secured, they provide excellent protection from high wind and storms. The shutters block direct sunlight, which blocks furniture-fading UV light and seriously reduces the amount of radiant heat entering your home, which means less demand on your AC unit in summer months and a lower summer electric bill. With Colonial Storm Shutters or hurricane-rated Bahamas Storm Shutters, it takes only minutes to protect your windows against hurricane force winds. The shutters are attractive, very easy to open and close and provide vastly superior protection than plywood. Imagine! No more standing in line to buy plywood when a strom comes. No more schlepping up and down ladders risking injury to protect your home from storms, flying debris and hurricane force winds. Colonial hurricane shutters and Bahamas storm shutters are custom made by John’s Shutter and Repair to the exact specification you need. And the shutters are powder-coated, which means your hurricane-rated, custom-made, extruded aluminum shutters that look like wood will never rot, never rust and will look as good as new for many years to come. Bahama shutters, made of strong extruded aluminum, are mounted with a top hinge. Telescoping side arms allow you to open and close the shutter at will and adjust the shutter for light control and privacy. Bahamas style storm shutters are decorative, available in a wide variety of colors and insurance-rated to protect your windows from hurricane force winds. 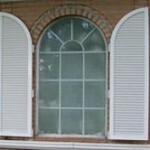 Colonial storm shutters from John’s Shutter and Repair are side-mounted and custom made to fit any opening. Colonial style storm shutters, made of strong, extruded aluminum, look like wood, come in a variety of colors and are an attractive addition to any home. Moderately priced, Colonial or Bahamas storm shutters are an affordable alternative to motorized storm shutters. 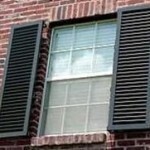 Colonial and Bahama storm shutters are attractive and look good on virtually any home. 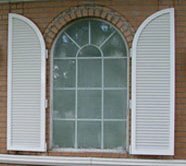 Colonial and Bahama storm shutters from John’s Shutter and Repair are custom made to the exact size and shape you need including arches, angles and curved tops. Colonial and Bahama storm shutters can be can be installed on virtually any home and can be operated from inside or outside your home. 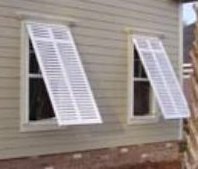 Colonial storm shutters and Bahamas shutters provide excellent protection from high wind and storms, provide excellent additional security anytime you want it and are excellent for light and heat control. Contact John’s Shutters and Repair at 409-939-5135 for a free no obligation quote and be sure and enjoy all the videos and other information on hurricane shutters, storm shutters and security shutters on this Web site. John’s Shutter and Repair serves Galveston, Texas City, La Porte, Le Marque, Kemah, Pasadena, Houston, Alvin Pearland and the entire Texas Gulf Coast from Beaumont to Rockport and Corpus Christi Texas.